Real Dreams: Thirty Years of Short Stories is an anthology of stories I wrote between 1981 and 2011. Each reflects changes in my writing style and interests over time. I wrote the earliest story at the age of ten, and the latest thirty years later. The stories are grouped by genre and style. You will find themes of hope, dreams, light, darkness, perseverance, and spirituality wrapped up in some novel ideas. Enjoy these diverse and timeless works three decades in the making. 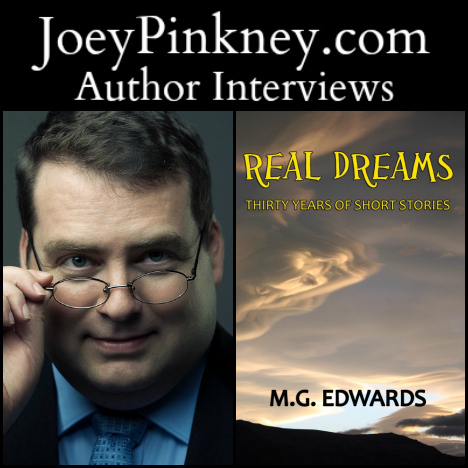 Joey Pinkney: Where did you get the inspiration to write Real Dreams: Thirty Years of Short Stories? MG Edwards: When I was ten years old, my elementary school teacher asked students to write tall tales in small groups and present them in class. Some chose to tell the story of Paul Bunyan and other well-known legends. JP: What sets Real Dreams: Thirty Years of Short Stories apart from other books in the same genre? MGE: Real Dreams has been described as “eclectic.” It may be unlike any other book because it features stories multiple genres penned over many years. It’s as if adolescent to adult writers from all sorts of genres got together and collaborated on a single book. I think it makes the book fun, diverse, and at the same time, thought provoking because many of the stories are quite innovative and unique. JP: As an author, what are the keys to your success that led to Real Dreams: Thirty Years of Short Stories getting out to the public? MGE: The key to an author’s success is finding your target audience and making your books available to potential readers. Having an online home such as an author’s website and a social media platform – especially on Facebook, Twitter, and Google+ — are critical to marketing and selling your books. You’re more likely to connect with readers online. Networking with fellow writers and contacts in the publishing industry and booksellers are critical to expanding your reach beyond the Internet. JP: As an author, what is your writing process? How long did it take you to start and finish Real Dreams: Thirty Years of Short Stories? MGE: Well, it took a long time – thirty years in the making! I don’t recommend waiting three decades to publish a book. My memoir Kilimanjaro: One Man’s Quest to Go Over the Hill is more indicative of my writing process. I initially gathered research for the nonfiction book; in this case, I climbed Mount Kilimanjaro in Tanzania and lived to tell about it. I reworked my personal journal into a manuscript that went through many revisions until it was ready for editing and publication. Although writing doesn’t have to be a difficult process, I often say that I’m not sure whether it was harder to climb Kilimanjaro or write about it. It takes discipline and determination to see a book through from start to finish. Real Dreams is a testament to this. I wrote a new story every few years until I had enough to publish in one book. JP: What’s next for MG Edwards? MGE: I’m currently writing a memoir about my father and the legacy of the Vietnam War. After my father died unexpectedly and left me a set of mysterious photographs taken during his 1968-69 tour in Vietnam, I embarked on a seven-year quest to uncover his story. The book will be published in 2015. It’s about the search for the truth about my dad’s time in Vietnam and how the war affected him and other Vietnam veterans.